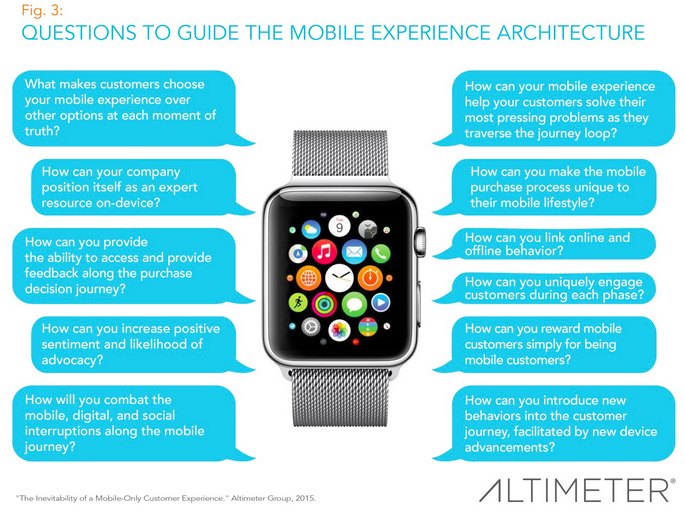 This post originally appeared on Altimeter Group’s blog. To create experiences that resonate with both mobile-first and digital-first customers, companies must learn more about consumer frustrations, expectations, and desires specific to each mobile device used. In our recent report on mobile customer experience (CX), we explored how companies can move beyond being simply “mobile ready” or “mobile-optimized” and into a new standard of “mobile only.” Brands are only just beginning to focus on architecting mobile experiences that are both self-contained (beginning to end) and also complementary to the digital customer journey at large. To do so takes a foundational understanding of customer behavior, garnered through research, at each step in the digital customer journey (DCJ). From there, organizations move toward re-imagining the mobile-first customer journey by defining a series of intended mobile experiences at each stage, for each device, that align with previously defined customer personas and supporting data. Once the mobile journey has been thoroughly mapped, organizations support each step with previously gathered customer data. Altimeter Group finds brands most often incorporate mobile customer data in two ways: known customers (via unique ID, like a loyalty program or other login) and unknown (those who are unidentifiable). For both categories, data such as mobile usage, engagement, time on app or mobile site, etc., are easily accessible data points that can be tied to each step of the ideal mobile experience. For known customers, brands are beginning to identify at what point during the purchase decision cycle customers use mobile, when they jump to another channel, and when/where they eventually convert to purchase. This information is key to support why each step of the ideal mobile experience is critical to keep customers on-channel and contained throughout brand engagement. By looking deeper into customer insights, beyond current behaviors and toward desired experiences, mobile strategies are quickly moved from misinformed to engaging. Let data analysis and predictive experience mapping take center stage, as they’re focused on the real driver of ROI: your customers.